In granting plaintiff's motion for summary judgment that its claims were not barred by prosecution laches, the court rejected defendant's argument that "plaintiff lacked a reasonable basis for filing the continuation application and therefore plaintiff must have intended to prejudice [defendant]. . . . No doubt there is a potential for abuse of the continuation process. But in this case, defendant relies on little more than the timeline of events to establish that plaintiff abused the system. That timeline -- without additional evidence that plaintiff improperly delayed issuance of [one of the patents-in-suit] -- is insufficient evidence to prove laches." Delay From Stay Pending Reexam Not "Inherently Prejudicial"
In denying plaintiff's motion to lift a stay, the court rejected the argument "that 'justice delayed is justice denied' . . . [T]here is no doubt that justice has been delayed. But for whom has justice been denied? There have been multiple appeals in this case, and [plaintiff], who raises the issue of delay, has benefitted by each. . . . 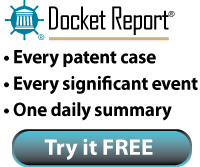 Since the PTO must move with special dispatch in the reexamination of the [patent-in-suit], waiting for an indication from the PTO of its next move will not unduly prejudice [plaintiff], especially since reexamination delays, though undesirable, are a reality of the patent structure and therefore are not inherently prejudicial." Defendant's motion to compel the production of documents regarding negotiations with licensees of the patent-in-suit was granted in part. "[T]he Court finds [ResQNet.com, Inc. v. Lansa, Inc., 594 F.3d 860 (Fed. Cir. 2010)] has not upset this district’s case law regarding discoverability of settlement negotiations. . . . The Court declines to upset its traditional approach to this issue absent clear precedent compelling a new tack. Continuing to exclude underlying negotiations is consistent with this Court’s past decisions. . . And is most appropriate given the chilling effect such discovery would have on settlements. While the Court recognizes internal settlement strategy may be protected by attorney-client privilege or work-product immunity, the possibility of some negotiation materials being discovered could hamper negotiation efforts and interfere with settlement discussions. . . . The Court permits discovery of negotiations pertaining to agreements and licenses entered into outside the context of litigation, but not of negotiations pertaining to agreements that settle law suits." The court granted plaintiffs' motions for summary judgment of no induced infringement where defendant did not include indirect infringement allegations in its contentions and the court denied its motion to amend infringement contentions. "[Defendant] contends that its omission of the Rule 3-1(d) disclosure was merely a 'scrivener’s error' and that summary judgment should be denied because defendants have been on constructive notice of [defendant's] indirect infringement claims since the inception of the case. . . . Though the court is reluctant to dispose of substantive infringement claims based on noncompliance with the Patent Local Rules, [defendant's] failure to comply with Patent Local Rule 3-1(d) goes to a substantive element of a claim of indirect infringement, not merely a procedural defect." Magistrate Judge John S. Bryant in the Middle District of Tennessee has recommended fining a False Marking defendant an amount representing just 10% of total revenue earned on sales of the falsely marked product, due to the inability of the defendant to actually pay the fine. The Magistrate Judge also recommended granting the plaintiff’s motion for permanent injunction, but denied the motion for treble damages. The case is somewhat unique because the summary judgment motions leading to the court’s rulings were unopposed due to defendant’s inability to pay its attorneys. Custom Designs of Nashville, Inc. et al v. Alsa Corporation, 3-08-cv-00665 (TNMD June 21, 2010). Plaintiff's motion for a permanent injunction was denied. "Because [plaintiff] is not competing with [defendant], it is more difficult for [plaintiff] to argue that it will be irreparably harmed without an injunction. This fact weighs heavily in the Court’s analysis. . . . [Plaintiff] has never used the [patent-in-suit] to develop a product. . . . Further, the claimed invention embodied in the disc-drive is but one relatively small component of the entire assembled computer. When the patented invention is but a small component of the accused product, it weights against a finding of a permanent injunction. Still further, [plaintiff] has repeatedly entered into numerous one-time, lump-sum licenses on the [patent], and [plaintiff] has always sought monetary awards on the [patent]." The court granted defendant's motion to dismiss plaintiff's qui tam false marking claim where plaintiff failed to sufficiently plead an intent to deceive under Rule 9(b). "[T]he mere fact of mismarking a product does not necessarily show knowledge or intent. Thus, [plaintiff] cannot proceed with his claim absent any specific factual allegations indicating that [defendant] had knowledge of the mismarking or an intent to deceive the public." NetDocket LLC has licensed patents and trademarks from WhitServe LLC and seeks to commercialize this technology in the legal market, particularly for intellectual property management. The company's online offering is unique because it allows participating law firms to private label the application for the benefit of their respective clients. Clients get the convenience of secure, 24/7 portfolio management while law firms significantly enhance their client services, without the costly investment of developing and maintaining the software, hardware, and skilled staff necessary. Defendant's motion to transfer venue was denied. "The Court finds there will be significant overlap [with a co-pending case in this court] among the issues of claim validity, claim construction, and claim scope. This weighs against granting Defendant’s motion, as transfer would create duplicative proceedings on the same patent, unnecessarily wasting judicial resources and creating the possibility of inconsistent results. Although this fact may not be dispositive, it is 'a paramount consideration' for the Court. . . . [T]he only defendant in this case is headquartered within two hours of this courthouse, residing just miles from the bounds of this district. Although access to some third-party sources of proof would be more convenient in the District of Massachusetts, transfer would make access to Defendant’s sources of proof [in Dallas] more difficult. The Court also notes transfer would ease the burden of travel for several witnesses, notably several non-party witnesses located in the proposed transferee district. These gains in convenience do not, however, outweigh the substantial loss of judicial efficiency transferring this case would cause." Following a bench trial, the court concluded that defendants failed to establish inequitable conduct based on plaintiff's alleged failure to disclose the sample size of tests reported in the patent application. "[D]efendants assert that the data presented by table 2 of the [patent-in-suit] is based on a 'vanishingly small' sample size of testing. Defendants theorize that the inventors withheld the sample size so as to prevent the examiner from discovering the statistical insignificance of the presented results. . . . [D]efendants have not identified any requirement of the patent laws regarding statistical significance. Of course, the failure to disclose a small sample size could still fall within the ambit of materiality if, for example, the applicants told the examiner that the disclosed results met the FDA's requirement for statistical significance, or statistical significance was otherwise heralded in the specification of the [patent-in-suit]. Defendants have adduced no such evidence." The court granted defendant's motion to dismiss plaintiff's willful infringement claim for failure to state a claim. "In this case, [plaintiff] alleges that [defendant] manufactures and sells the [accused product]. [Plaintiff] also alleges that '[u]pon information and belief' [defendant] had 'full knowledge of the existence of the [patent-in-suit]' and the sale of the infringing product is 'willful and deliberate.' An allegation that 'upon information and belief' the defendant acted willfully is sufficient under [Ashcroft v. Iqbal, --- U.S. ----, 129 S.Ct. 1937, 1943-44 (2009)] if the plaintiff 'lists supporting facts' to show that the defendant had the requisite knowledge. . . . [Plaintiff] alleges no facts whatsoever to support its allegation that [defendant] had knowledge of the [patent-in-suit] and deliberately infringed on it. Therefore, absent facts detailing [defendant's] knowledge, [plaintiff's] willful infringement claim is insufficient." In granting plaintiffs' emergency application for a preliminary injunction, the court found irreparable harm. "Though many of the damages alleged will 'boil down to money,' the calculation of these damages will be very difficult. Also, the loss of goodwill associated with the brand is the type of injury that is the definition of 'irreparable.' Though not controlling in this case, the Lanham Act specifically defines the loss of goodwill as an irreparable harm in the injunction context." The court denied defendants' motion to stay pending reexamination in part, because defendants failed to raise invalidity as a defense and therefore a reexamination would not simplify any issue in the pending litigation. "[T]he Court finds that the case would not be streamlined by a PTO reexamination because defendants never alleged invalidity as a defense in their Answer nor did they disclose . . . any prior art by [the deadline stated in] the Pretrial Scheduling Order. In other words, there is nothing to streamline where invalidity is not an issue in this case." Plaintiffs' motion for a preliminary injunction was denied because plaintiff failed to establish a likelihood of success and defendant established a substantial question of invalidity due to obviousness. "In this case . . . there is a strong showing of obviousness, supported by the Examiner’s three rejections in the prosecution history of the [patent-in-suit] and the evidence provided by [defendant] that the prior art invited experimentation in regard to testing for benefits in regard to stability. . . ."
The court granted defendant's motion for a new trial on damages or for remittitur because the jury’s $57 million award was based on the entire market value rule and plaintiff failed to offer evidence that its patented disc-discrimination technology drove demand for personal computers. Plaintiff was given ten days to accept a remitted award of $6.2 million or face a new trial on damages. "The failure to offer any evidence that a disc-discrimination method patent drove the demand for the much larger finished good precludes application of the entire market value rule. At best, [plaintiff's expert] testified that almost all computers sold in the retail market include optical disc drives and that customers would be hesitant to purchase computers without an optical disc drive. This evidence notwithstanding, there was no evidence from which the jury could conclude that the patented features of the invention formed the basis for the customer’s demand for the entire computer. Further, the undisputed evidence is that an optical disc drive could be and were sold both as integrated units and separately." Solo Cup: Product "covered by a now-expired patent is 'unpatented.'" And, yes, Judge Shadur followed his own self-imposed rules of professional writing. No sentence in the order started with “a” or “the”. Although “but” is apparently permissible. The court granted defendant's motion to declare the case exceptional warranting an award of $4.8 Million in attorneys' fees based on plaintiff's inequitable conduct even though another court had already ordered plaintiff to pay more than $8 Million in fees and costs based on the same inequitable conduct. "[Plaintiff] maintains that despite its inequitable conduct which gave rise to the unenforceability of the patents-in-suit and the present 'exceptional' case, [plaintiff] has already been 'severely punished' by [another] court’s award of attorneys’ fees and costs in that case. . . . However, the Court’s decision to award attorneys’ fees and costs does not hinge on whether a party has been sufficiently 'punished' in another proceeding, but instead, focuses on the issue of whether in the Court’s discretion, [defendant] should be reimbursed for the cost of defending against a suit which [plaintiff] has conceded was based upon invalid and unenforceable patents. . . . The Court notes that [plaintiff] initiated these proceedings against [defendant] in this forum, seeking to exploit the protections afforded by the United States patent laws for patents that it improperly procured based upon its own inequitable conduct." The magistrate judge recommended that the district judge should not recuse himself. "Judge Folsom’s spouse owns stock in [a company that] owns a portion of the defendant. . . . At present, [the third party company] owns only approximately 4.85% of [defendant]. After receiving the submission of [defendant], the undersigned finds that this remote interest by [the third party] of a defendant is insubstantial and does not require a recusal by Judge Folsom." Defendant's motion for satisfaction or modification of a consent judgment following the ITC's determination that the patent-in-suit was invalid was denied. The parties' earlier settlement agreement contained an admission by defendant that the patent was valid, but relieved defendant of royalty obligations if "a judgment is entered that the [patent-in-suit] is invalid or unenforceable by a United States Court." The court rejected defendant's argument that the Federal Circuit's affirmance of the ITC's determination of invalidity relieved defendant of royalty obligations. "[T]he court need not reach the issues regarding whether the ITC's determination of the [patent-in-suit] has preclusive effect. . . . [Defendant] is barred from challenging the validity of the patent in question by the exact terms in the consent decree and its Settlement Agreement where [defendant] admitted that the patent in question was valid and it agreed it would not challenge the validity of the patent. . . . [T]he court views the current motion [pursuant to] Rule 60(b) as an improper attempt to attack the validity of the patent in question via the back door, which is barred by the terms of both the consent decree and the Settlement Agreement." Defendants' motions to reconsider claim construction were granted. "The Court rejects [plaintiff's] arguments that this Court should ignore the arguments and remarks made to the USPTO during reexamination, particularly in light that its arguments to the USPTO are contradictory to arguments it made to this Court. The Court will not allow [plaintiff] to make arguments as to the interpretation of claims in this Court and then to make contradictory arguments to the USPTO in distinguishing the prior art without any effect on the scope of the claim." In the earlier claim construction order, the court had adopted plaintiff's proposed construction of the term "unrequested," but upon reconsideration in light of plaintiff's arguments during reexamination, the court adopted a construction that was similar to defendant's proposed construction. Plaintiff's motion to lift a stay following the PTO's Notice of Intent to Issue Ex Parte Reexamination Certificate was granted. "Defendant is correct that the patent remains under review by the PTO until the Reexamination Certificate issues. But as Defendant also acknowledges, the NIRC terminates the prosecution stage of the reexamination. As Bob Dylan sang in 'Subterranean Homesick Blues,' 'You don’t need a weatherman to know which way the wind blows.' And you don’t need a Reexamination Certificate to know that this case is now poised to move forward." The court granted defendant's motion to dismiss plaintiff's contributory infringement claim for failure to state a claim. "Plaintiff alleges that the Infringing Toy is sold in the form of kits that require assembly. The items in these kits are apparently the components that form the basis for Plaintiff’s contributory infringement claim. However, because Plaintiff fails to allege that these components are not suitable for substantial noninfringing use, Plaintiff fails to state a claim for contributory infringement." The court sua sponte struck defendant's affirmative defense to plaintiff's false marking claim. "[Defendant] states that the United States is an indispensable party to this action. But that is at odds with 35 U.S.C. §292(b), under the auspices of which [plaintiff] has brought this action. . . . [Two other affirmative defenses], which challenge the statute’s constitutionality and its conferring of litigation rights on a party such as [plaintiff], are permitted to stand." The expiration date of a U.S. Patent is not readily ascertainable by members of the public at the time of the product purchase. The patent number itself does not provide members of the public with the expiration date of the patent. Basic information about a patent, such as the filing, issue and priority dates associated with a particular U.S. patent number are available at, for example, the website of the United States Patent and Trademark Office (“USPTO”). However, access to the Internet is necessary to retrieve that information (meaning that a consumer may not have the ability to retrieve the information, especially while he is in a store making a purchasing decision) and even after retrieving that information, it does not include the expiration date of a patent. Rather, a member of the public must also conduct a burdensome legal analysis, requiring specific knowledge of U.S. Patent laws regarding patent term expiration. Notably, a correct calculation of the expiration date must also account for at least: a) any term extensions granted by the USPTO, which may or may not be present on the face of the patent, and b) whether or not the patent owner has paid the necessary maintenance fees. Amended Complaint filed April 27, 2010. The plaintiff following Mr. Simonian’s lead is Patent Group, LLC, the second most prolific plaintiff in false marking cases - a distant second to Simonian. Read the amended complaint here. Incorporation in Forum State Shortly Before Filing Patent Infringement Lawsuit "has the Appearance of Forum Shopping"
In granting defendants' motion to transfer venue, the court rejected plaintiff's incorporation in Arkansas as a basis for retaining venue. "The only connection this case has to the Western District of Arkansas is that defendants sold the products in question [in this forum] for nationwide distribution and [plaintiff's] incorporation in Arkansas three weeks before filing suit. . . . [Plaintiff's] incorporation in Arkansas just twenty days before filing this lawsuit does not help [plaintiff] because it has the appearance of forum shopping. Indeed, defendants point to other instances where courts have transferred cases involving [plaintiff's parent's] subsidiaries because of suspicions of forum shopping."